Ascertaining the stability of symptom clusters and identifying sentinel symptoms have been top priorities in symptom cluster research. Identifying sentinel symptoms would help to determine the underlying mechanisms of symptom clusters and facilitate effective symptom management. This study aimed to evaluate the stability of symptom clusters during the 1st and 2nd cycles of adjuvant chemotherapy (CTx) and to identify sentinel symptoms. This is a secondary data analysis of data from the Paradigm Shift in Chemotherapy-Induced Nausea and Vomiting (PS-CINV) study. 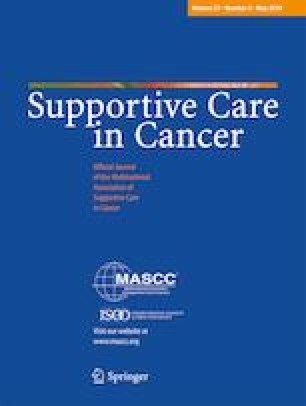 Data utilized were from cancer patients who received adjuvant chemotherapy and completed symptom evaluation in the 1st and 2nd cycles (N = 209). The severity of 20 symptoms was evaluated on a 0-to-10 numeric rating scale. Principal component and hierarchical cluster analyses identified symptom clusters, and principal variable analysis identified sentinel symptoms. Among 20 symptoms, 13 symptoms formed 4 symptom clusters in the 1st cycle: a physical-psychological (pain, dyspnea, sleep disturbance, anxiety, depression), a gastrointestinal (nausea, loss of appetite, taste change), a fatigue-cognitive (fatigue, difficulty concentrating, drowsiness), and a urosexual (urinary problem, sexual problem) symptom cluster. During the 2nd cycle, stable symptom clusters were identified, with merging of the physical-psychological and fatigue-cognitive symptom clusters, resulting in three clusters. Sentinel symptoms were identified in the following order: anxiety, loss of appetite and fatigue (1st cycle) and loss of appetite, depression, and fatigue (2nd cycle). Symptom clusters demonstrated phase-specific stability. The current study identified a core set of symptoms that form stable symptom clusters during the 1st and 2nd cycles of CTx. Principal variable analysis identified sentinel symptoms which could facilitate efficient symptom management. The current study was supported in part by the Basic Science Research Program through the National Research Foundation of Korea, funded by the Ministry of Education, Science, and Technology (2012R1A1A1010107 and 2015R1A1A1A05001342), in part by the Chungnam National University Research Fund (2016-1793-01), and in part by the National R&D Program for Cancer Control, Ministry of Health and Welfare, Republic of Korea (1520190). The study was approved by the institutional review board of the participating hospital (approval number: 4-2014-0700). Participants received detailed information regarding the purpose and details of the study from research nurses. Informed consent was obtained from those who agreed to participate.